Haji Ali at Night, a different night. There's a mosque behind it. On Friday, Aug 12th, Twyla and I rode the train to town with the intention of visiting Haji Ali Mosque. Haji Ali is a beautiful mosque built on an island only accessible by foot during low tide. It was high tide when we got there. 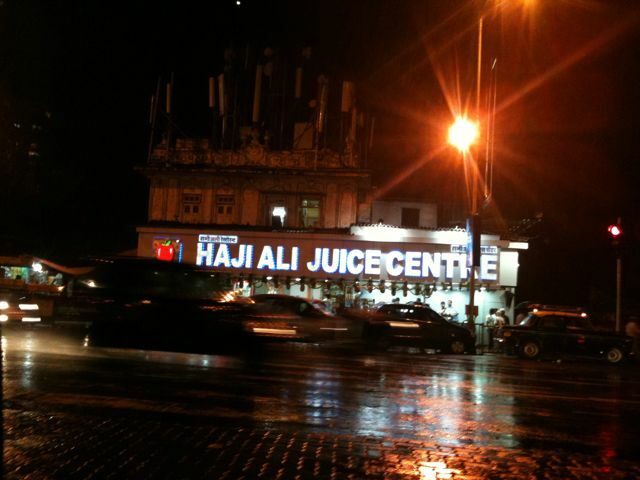 So Twyla took a couple of pictures and we went to the almost-as-famous Haji Ali Juice Center nearby. Taking the train cost 4 rupees to go from Bandra to Mahalaxmi Station, and then 6 rupees to go from Mumbai Central back to Bandra. The train was fairly quick, and…. I hate to keep making these comparisons, but it was less crowded than the subway in New York in the middle of the day. I still made sure to put my cellphone in my turkish man-pouch and tie it to the drawstring in my pants so I could feel whether someone was trying to pick pocket me. No one did. But that could be because everyone was distracted by Twyla. Twyla was the only women in our train car. There are two women-only cars on each train, but we were unable to find them so Twyla rode with me and braved the gropers. She got groped once by a sneaky, stealth groper on the way to town. There were zero gropes on the way back when it was less crowded. As for how the train worked, the train would stop briefly at each station, at which point you had to jump off the train quickly before people started piling on. The standing area near the door was the most coveted spot, as you could hang out the door while the train is moving and air out your armpits. That’s where Twyla and I were for most of the gropefree ride back to Bandra. Buying the ticket was interesting. I saw my first emaciated beggar at the train station. The beggar sat down on the ground between the service lines, and would squeeze each person’s foot while they were getting serviced. Every now and again someone would throw a rupee. Each customer is expected to obtain a paper ticket before boarding the train. There are two ways to get this ticket. One is by standing in line to get a ticket from a counter. The faster way is to use an electronic card that stores a rupee balance that can be used to buy tickets from an electronic ticket machine. You buy these cards over the counter and refill them at a counter as well. The first card I bought did not work, but the second one worked just fine. We had a lot of juice at Haji Ali. It was pretty good, but not delicious. Later that day, J told us we should try the pizza next time we are there.